Closet Makeover // Downsizing Your Wardrobe & Declutter! | Chelsea B. 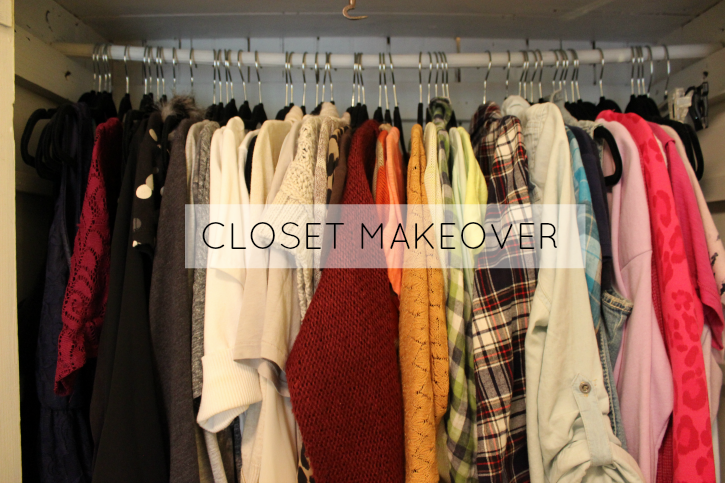 Closet Makeover // Downsizing Your Wardrobe & Declutter! Recently, I realized that I have too much stuff. I found myself complaining that I didn't have enough room, when it hit me. If I had less stuff, I wouldn't be complaining so much! I'm going to do a blog post later discussing more of how I decided to declutter and get rid of a bunch of stuff. But for today, I want to talk about how I downsized my wardrobe and decluttered my closet. My closet isn't exactly a closet, it's actually an old wardrobe that doesn't have an entrance to Narnia. It also doesn't have very much space, which is where the downsizing comes into this. Here are my tips on how to declutter and downsize your closet! This is a good question to ask yourself when going through your wardrobe, "If I was shopping right now, would I buy this again?" Chances are, you wouldn't. That's how it was for me. I had a lot of old Abercrombie and Hollister clothing that I bought when I was sixteen. Now that I'm almost twenty (next week! ), I don't shop at those stores anymore. There's nothing wrong if you do, they're just not my style now. For the longest time, I didn't know what my style was. Then I joined Pinterest and started pinning a whole bunch of things to my fashion board. When I was cleaning out my closet, I kept that board in mind. My style now is really simple, I just like to wear the basics. So if it didn't really fit my style or I didn't feel like it would fit in with the outfits on my Pinterest board, I got rid of it. This was a big one for me! I lost 38 pounds, and a lot of the clothes in my wardrobe were too big. This is something good to keep in mind whether your clothes are too big or too small. If it doesn't fit, get rid of it! -How many times have you worn it? This is another good question to ask yourself! I found a few items that I had in my closet that I know that I have only worn a couple of times. And don't tell yourself that you'll keep it because you'll wear it. Those items that I just mentioned, they were in there from the last time I cleaned out my closet. I kept them because I told myself that I'd wear them again. I never did, so this time they went out! -Are you not getting rid of it because you don't want to waste money? We all have clothing in our closet that we've never worn. I had some clothes in my closet that I had never worn, the price tags were even still on them. They were too big and I just felt horrible. I felt like I wasted so much money on these items because I couldn't return them now. I got to thinking and I realized that the money was already wasted. And it was already gone. Keeping the items wasn't going to unwaste my money. Once I realized this, I was ok with getting rid of the clothing. They weren't doing me any good just hanging there in my closet! Now they're going to a thrift store, where someone else can enjoy them. -Give it away or donate! That brings me to my next tip. Instead of throwing away your clothes, give them away! Give them to friends who might need them or donate them to the thrift store so others can enjoy the clothing. Or if you want to make a little money to put towards new items in your closet, take your items to a consignment shop where they take your clothes off of your hands and pay you for them. 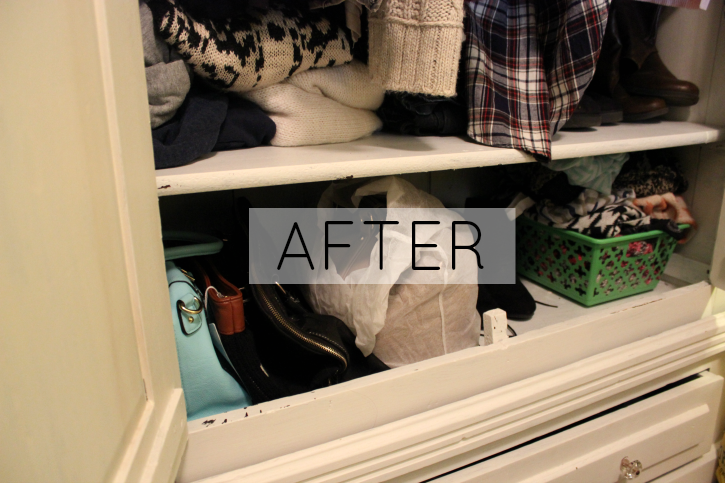 My last tip is to get your closet organized! My favorite things for organizing are the space saving hangers. You can get 25 in a pack at TJ MAXX super cheap. 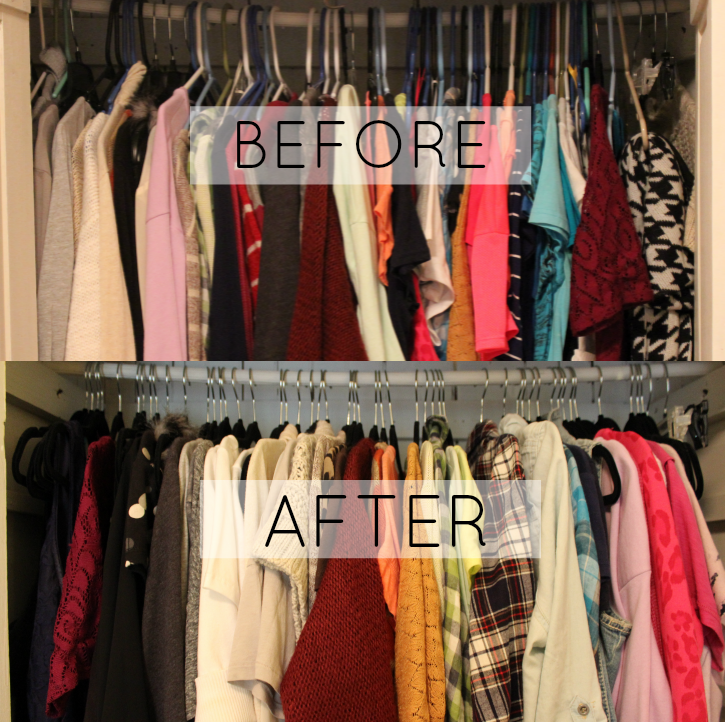 This will help create more space in your closet. I also like to take my closet organizing just a little bit farther and have my clothes organized by color. That step is definitely optional! 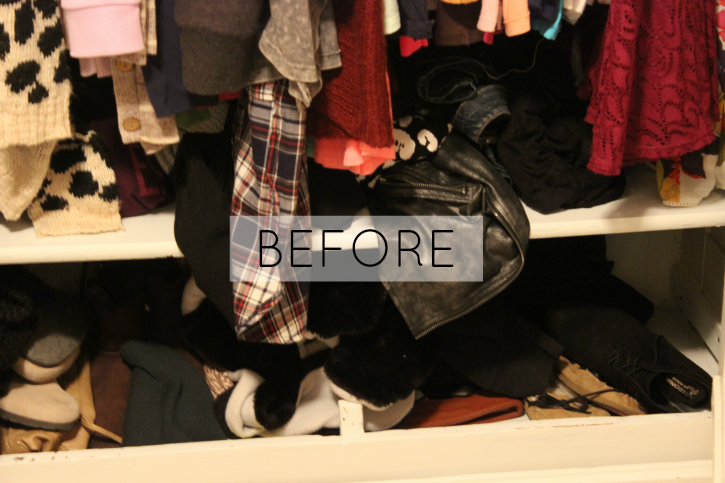 Let's take a look at the before and after of my wardrobe! The after picture looks SO MUCH better! Baskets are a great way to store things and it also keeps them hidden. You can get baskets at the Dollar Store for...get ready...$1. Who ever says it's expensive to organize has clearly never been to the Dollar Store! Right now for my scarves, I just have them in an ugly green basket. I do plan on changing the basket to a white one next time I make it to the Dollar Store. I think when it comes to the clothes that need to be folded (sweaters, jeans) it's ok to leave them on the shelf. I also think it's nice to have them in a basket because it keeps them hidden, which can also keep them cleaner. I actually downsized my shoes quite a bit! I had a couple of pairs of shoes that I loved, but they just didn't fit quite right. I kept them because I thought I could squeeze my feet into them, and I did, but it left me with painful blisters from the shoes rubbing on my heels. I ended up finally getting rid of them! I'm all about comfortable shoes, so I got rid of a lot of the shoes that I couldn't stand to stand in for very long or walk in. So that's how I downsized and decluttered my closet! I hope this blog post helps you guys. I hope it motivates you to downsize and declutter your closet. I can't wait to continue this series, I'm going to show you guys how I downsized my makeup collection next!